Running the proper air pressure for the type of terrain you are traveling on is a fundamental of off-roading. The less air pressure you have in your tires, the larger the contact patch you will have, giving you the largest footprint possible for maximum traction on soft surfaces such as snow or sand. A tire with lower tire pressure will also provide considerably more traction when climbing over obstacles because the tire can conform to the surface and grab on to whatever you are trying to get over. Additionally, lower tire pressure allows the sidewall to flex more for a comfortable ride on the trail and a decreased risk of tire damage from sharp rocks, roots, etc. 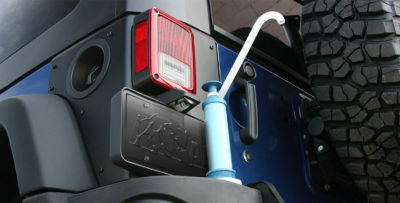 AEV’s EZ Deflator allows you to quickly and safely remove the valve stem core for rapid tire deflation. Simply screw the EZ Tire Deflator onto the valve stem. Turn the deflator knob counter clockwise to unscrew the valve stem core. Then slide the collar up to begin releasing air. Slide the collar back down to stop the airflow or to check your air pressure. Finally, screw the valve core back into the valve stem and remove the EZ Tire Deflator. The AEV EZ Deflator has been engineered and tested to ensure accuracy, without being affected by temperature, humidity or altitude. A high visibility, yellow rubber guard protects the easy to read dial that displays air pressure from 0-60 PSI in 1 PSI increments. A convenient storage pouch is included to keep your EZ Deflator safe when not in use. Mechanical accuracy rating certified to ±2%.